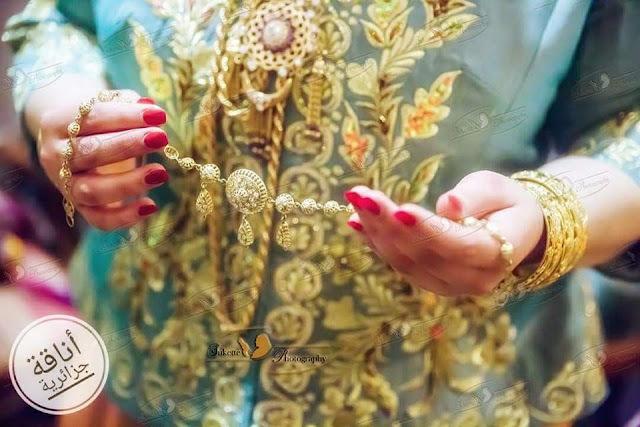 The famous and fabulous jewel that enhances the beauty of the Algerian woman is "khit errouh" or "zerouf " in the Algerian dialect ,which literally means "thread of the soul". This jewel is rooted in the Algerian traditions .It is very traditional Algerian jewel that all Algerian women should possess and which is transmitted from mother to daughter and it is kept throughout a lifetime, thus, some families have very old khit errouh and therefore it becomes very expensive and worth a fortune today. Originally, khit errouh is from the city of Algiers and it is generally worn on weddings. It is a type of tiara that consists of rosettes (old models) in the form of “drops” and gold “Zerraref” pendants set with diamonds or other precious stones, depends on the status of the family. A wealthy family, for example, will not hesitate to make it with stones of great value, such as diamond. It can be matched with earrings, a ring or a bracelet. In general, the parents bought it for the trousseau of their daughter. If not, they can ask for the dowry of their daughter. The shape of “Khit errouh” is also special, it consists of small round shaped components inlaid with precious stones, in the center the shape is much larger with obviously several stones encrusted. On this form is attached another part shaped water drop large enough, it is the same for the two small balls contiguous to the central ball. This precious jewel is worn through the front, surmounting a silk scarf called “mhramet leftoul” (the famous long scarf that Algerians wear traditionally on the head) ,with traditional outfits. The Algerian women wear khit errouh exclusively with Karakou (Algerian traditional outfit), but when they wear another outfit, it is put on the neck. This jewel adorns the brow or the neck of the woman and specifically the bride in a beautiful way that’s why it still worn nowadays.